"Receiving these awards is always an honour. They represent all teams hard work, the attention to our customers, and BRP's passion and expertise. 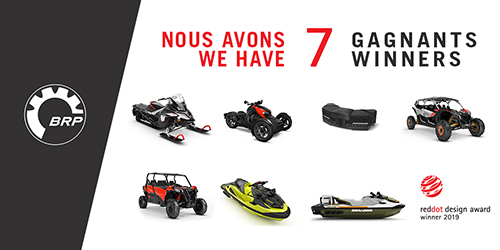 This recognition demonstrates BRP's thirst for innovation, and its success as a pioneer in the industry", says Denys Lapointe, Senior Vice-President, Design, Innovation and Creative Services. Last year, BRP marked a record year with 15 design awards in total. 2019 is off to a strong start, and BRP's design team intends to outdo itself again. The Red Dot product design awards focus, among other things, on the design quality and innovation potential of the products submitted. The laureates of these awards are cutting-edge products, that set trends and pave the way for the future. Red Dot's panel of approximately 40 experts carefully evaluates them to choose those that merit the distinction. For more information on BRP's 2019 Red Dot design awards, visit www.brp.com. Ski-Doo, Lynx, Sea-Doo, Evinrude, Rotax, Can-Am, Alumacraft, Manitou and the BRP logo are trademarks of Bombardier Recreational Products Inc. or its affiliates. All other trademarks are the property of their respective owners.